This article was published in the Packet Magazine’s January issue, but it has not gone online, so I am putting it in this post. A dinner delivery (or drive-by pickup) service can be a great convenience for busy households and for anyone who can’t always get out to grocery shop, or who may have limited mobility to prepare food. Enjoy! We’ve all been there: It’s 7:00pm and dinner is nowhere in sight. You didn’t have time to cook ahead, the larder is bare, and the last thing you want to do is go grocery shopping, or, frankly, cook at all. Frozen meals don’t cut it, and most delivery and take-out menus are full of salty, fatty, processed foods. Don’t despair, there are ways to order freshly prepared healthful meals that can be delivered to your door or conveniently picked up. This isn’t just an indulgence for time-challenged professionals, either. These dinners can be a lifesaver for the elderly, a household with a new baby, or someone recovering from an illness or injury. While these services generally charge more than if you cooked yourself or bought supermarket or other take-out food, they tend to cost less than having a personal chef come cook in your own kitchen, since the service will prepare a higher volume of meals. They accommodate special dietary needs, too. Here are four options in our area. All but one deliver. Examples of dinners include Jambalaya ($80 for four), homemade pasta with butternut squash, toasted hazelnuts, and salad ($75 for four), and veal stew with polenta and Broccolini ($100 for four). There are always some add-ons available, too, in individual quantities, such as French onion soup, porcini risotto cakes, and salads. 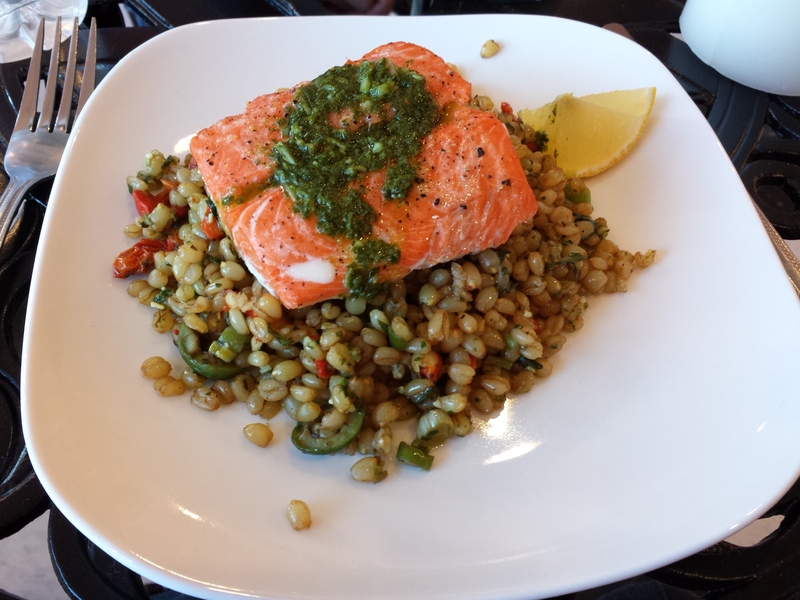 The roasted wild salmon I enjoyed when I had lunch with Tina at the Dessert Boutique, was served over wheat berries, and topped with chimichurri sauce – delicious and healthful. Tina Cucina (tinacucina.com) is based in the Dessert Boutique at 1378 Route 206 in Skillman, across the street from the ShopRite. Email tina@tinacucina.com to get on the weekly email list for menu options. Minimum of 24 hours’ notice is required for dinners, more is appreciated. Meals feed four adults unless otherwise specified, but you can order for less than four, as long as she is already preparing another order for four and you pick up in-store. For questions, call 609-362-CHEF (2433). Kathleen Rana, who owns the Jersey Girl Café in Hamilton, uses that kitchen to prepare meals for her Chef Express personal meal service. She is a member of the US Personal Chef Association, completed the Culinary Business Academy program, and also attended Mercer County College’s culinary program. She started as a traditional personal chef, going to clients homes, and preparing meals. Eventually, wanting to provide a more economical service, she started Chef Express, where she posts a new menu online each week offering a variety of meat, chicken, seafood, and vegetarian meals. In order to keep weekends free for her catering business (Madeline’s Table), she cooks Chef Express meals on Thursday, so they are ready for pickup or delivery on Friday. Her menu is extensive, and even includes healthful snacks and breakfast items. Meals can be ordered for one person or more, and if you sign up for more weeks, the price drops to as low as $9.95 per meal for six people on the 24-week plan. Side dishes can be substituted with à la carte sides, and additional portions of sides, snacks, soups, and whole grain salads may be ordered and are priced separately. Chef Express has clients on special diets such as organic, Paleo, Atkins, Pritikin, and special elimination diets. For those clients, cooking is done on a separate day to avoid cross contamination. In fact, on her website, items are coded to indicate which special dietary needs they satisfy, nut or gluten-free, dairy-free, low-calorie-but-nutrient-dense, etc. Some dinner examples are whole grain lasagna noodles with part-skim cheese and lean beef sauce with organic spinach salad; Greek-style grilled salmon with brown rice; Indian simmered spinach and potatoes with roasted cauliflower; and boneless chicken with raspberry balsamic sauce and Brussels sprouts. Breakfast items include yogurt parfaits, honey-roasted sweet potatoes, and omelets with low-fat cheese and vegetarian “sausage,” and Rana even offers kids’ “Happier Meals” as an nutritious alternative to the usual kids menu fare. Jersey Girl Café (jerseygirlcafenj.com/) is at 731 Route 33, Hamilton (609-838-9799). The url for ordering is http://jerseygirlcafenj.com/meals. Email: info@jerseygirlcafenj.com. Pickup is from the restaurant in Hamilton, or they deliver up to 15 miles from the café, with a charge of up to $15 depending on location. Christopher Dutka’s meal program serves Monmouth, Middlesex and parts of Mercer and Ocean counties. He also owns a full service catering business, doing major corporate and private events at prominent venues in New Jersey and New York. He offers special wine dinners and cooking classes, too, and his delivered meal program tempts with a wide variety of gourmet meals, available for singles and families. Clients are emailed the upcoming menu choices on the Thursday before the scheduled delivery date, in addition to putting menus online. There are about nine choices for the week, and clients have until Saturday at noon to respond with their choices. Meals are packaged (never frozen), labeled and delivered to your home in coolers on your delivery date ready to be reheated. They’ll even recycle your washed containers for you if you like. Chef Dutka’s menus read like upscale restaurant fare, and range from 3 meals for one for $95 to five meals for four people for $390, so quantity brings the price down. A typical week might include pasta with pancetta, caramelized onions, and roasted cauliflower with grilled chicken or shrimp; grilled mahi mahi with Mediterranean salsa and roasted garlic white bean purée’ Southwest grilled sirloin steak with corn and cheese cakes and chimichurri sauce; glazed salmon with rice noodles and Asian vegetables; or pork tenderloin stuffed with spinach and feta, roasted new potatoes and spicy green beans. Most meals can be prepared gluten-free, and pastas can also be regular or whole wheat. Christopher’s Kitchen Catering is based in Morganville, (732) 491-3399. Menu/pricing/ ordering is at http://www.cateringservicenj.com/ (click on Services). For questions, email christopherskitchennj@gmail.com. Terra Learning Kitchen (informally called TLK), opened in the Princeton Family YMCA in November, and as of this writing their menu and dinner program is still a work in progress. The café is the latest brainchild of brothers Raoul and Carlo Momo, of Terra Momo Restaurant Group. They own several other restaurants in the area, Teresa Caffe, Mediterra and Eno Terra, in addition to the Terra Momo Bread Company. They also provide the food at the Princeton Public Library and McCarter Theatre, plus the meals for One Table Café at Trinity Episcopal Church. TLK is a natural fit for the Momo’s love of community, and expresses the Y’s values of nurturing the mind, body, and soul. They will also offer cooking lessons. For their chef, the Momos recruited Tiffany Baldino (formerly Millen), whom I wrote about when she owned her own dinner delivery service, Simply Nutritious Meals, which I myself patronized. Some of the foods at TLK, such as the turkey and bean “breakfast chili,” are based on the popular Suppers Program founded by Dorothy Mullen, furthering TLK’s commitment to healthful whole foods. While TLK is still working on the dinner part of their service, substantial soup, chili, and grain salads (and more) are available all day, and can be packaged to pick up before 6:00pm when they close. 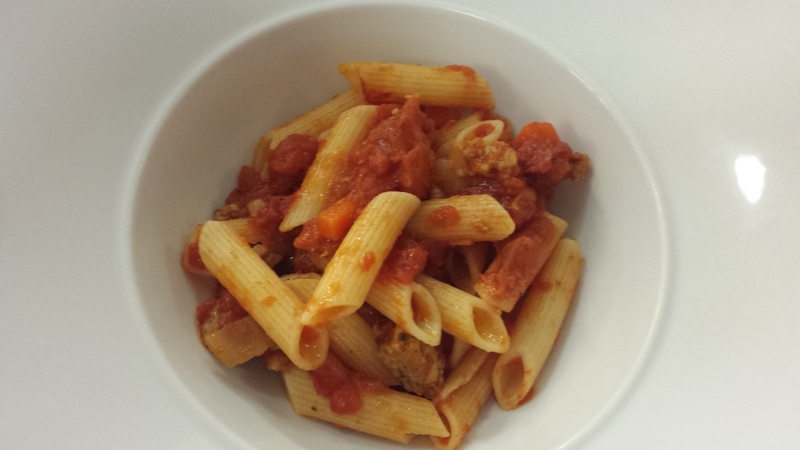 When I visited, they treated me to a bowl of gluten-free penne pasta with Griggstown Farm chicken sausage and tomato sauce, topped with Parmesan cheese. It was delicious, and I doubt I would’ve noticed the pasta was gluten-free if I hadn’t been told. Other plans for dinners include salad “kits,” roast chicken, baked pastas, and Suppers program macaroni and cheese. On the current menu, the breakfast chili and soup is $3 per serving or $6 per quart, while salads (kale, mixed greens, or spinach) are $4 and $7 depending on portion size. I especially liked a Tuscan kale salad with sun-dried tomatoes, toasted almonds and crumbled feta cheese with lemon-garlic white balsamic vinaigrette. Also good, a substantial main dish salad of quinoa and black beans over kale. Terra Learning Kitchen is located inside the Princeton Family YMCA at 59 Paul Robeson Pl., Princeton, (609) 584-1664. They are open Mon.-Fri., 8 a.m.-6 p.m. Order (and pre-pay) by downloading the Chow Now app to your iPhone or iPad, or use the link on their Facebook page at https://www.facebook.com/TerraLearningKitchen. They don’t deliver, but will carry your order out to you for curbside pickup by pre-arrangement. Since this article went to press, FreshDirect has started delivering in the Princeton Area, which is another option, but those meals are not locally prepared, and customizable, plus you must be home for delivery. Stay tuned; when I get a chance to try some, I’ll report back to you here. Faith, this is such a thorough and lively introduction to meals at home in our region! I would guess that Princeton is pretty unique in having access to such excellence so easily. Thank you for always keeping us not only au courant, but actually ahead of the game, gastronomically speaking.